A picture taken on April 29, 2011 shows water birds flying over a Danube Delta's canal next to Tulcea city, 290km east from Bucharest. Bulgaria and Romania on Tuesday signed a deal to set up three wetland areas along their joint 470-kilometre (290-mile) Danube border, protecting pelicans, herons, pygmy cormorants and other birds, the environment ministry here said. Bulgaria and Romania on Tuesday signed a deal to set up three wetland areas along their joint 470-kilometre (290-mile) Danube border, protecting pelicans, herons, pygmy cormorants and other birds, the environment ministry here said. The agreement will establish a zone in the east around Bulgaria's Lake Srebarna and Romania's Lake Calarasi; a second in the centre, around Belene island and Lake Suhaia; and a third in the west, around Ibisha island and Lake Bistret. It was signed by environment ministers Ulian Popov of Bulgaria and Rovana Plumb of Romani. 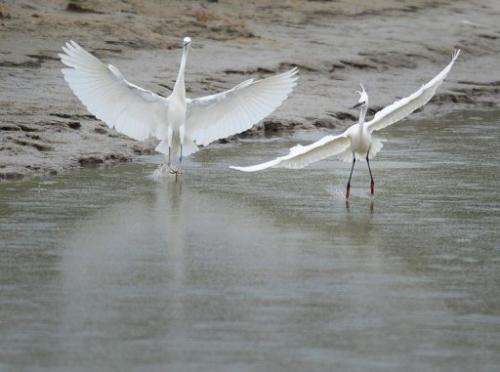 "The two countries will be able to take coordinated, cooperative measures to better protect wetlands and migratory species, which feed, winter, nest and breed on both sides of the river," said green group WWF, which is playing a coordinating role in the cross-border deal. Measures could include logging and hunting bans and preventing access to bird colonies during the breeding season, it added. The deal will be submitted this year for approval by the Ramsar Convention, a 42-year-old international treaty on wetlands conservation.